Designed in the year 2008 by Carsten Jörgensen, the Trumpet attempts to provoke an instrumentation of light; both sending an unfiltered direct light downwards and an ambient light through the cocooning along the helix structure providing the longitudinal trumpet like shape. 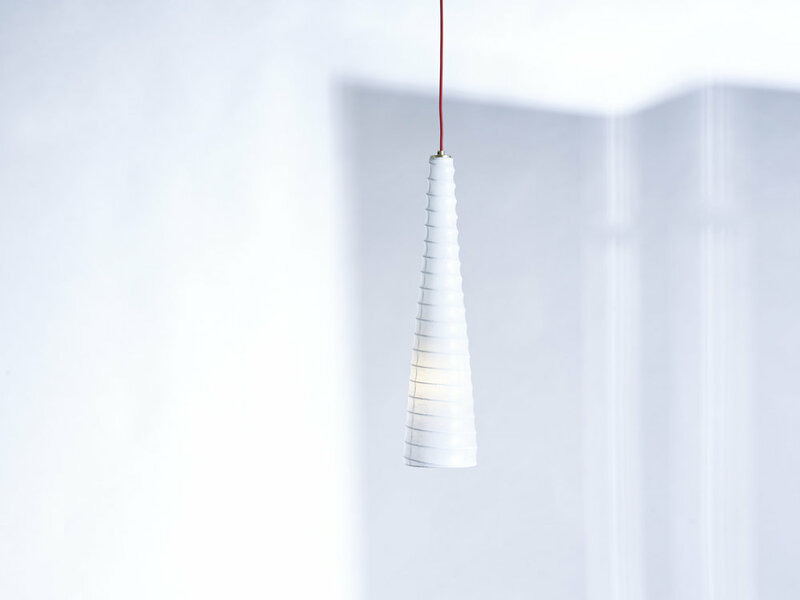 The designer was occupied by creating a crossover between an ambient light and at the same to provide a direct task light making the Trumpet light useful as a suspended lamp over a table where both properties are in demand. As simple as the idea might have been it was easier thought than done. It should be one of the most complicated lamps in the madetostay cocooning lamp collection. To produce the helix wire in a dynamic expansion from a diameter of 4 cm to 16 cm over a length of 68 cm has assumedly caused an aggressive orchestration of Italian words trumpeted out in the north Italian workshop where helixes after helixes was turned out. Mr. Bellini’s valuable knowledge saved the realization of the Trumpet in another row of Italian vocabularies. Due to the dim-ability of the light source it is easy to adjust the intensity of the light coming from the Trumpet and in this way to accomplish a desired ambiance. This is the reason we have chosen LED as a lighting source for nearly all madetostay lamps. With a guaranteed life cycle of the madetostay LED bulbs of 25000 hours it becomes a reason more to choose LED. Therefore we have decided to offer the same length of guarantee for the Trumpet. The Trumpet is shaped over the internal white powder coated steel helix structure and supports the cocooning polymer (plastic) fibre. The cocooning screen is provided with two additional protecting translucent matt lacquer finishes, which makes it possible to clean the surface of dust and other emissions from the air. The cocooning is soft and can withstand light pressure from non sharp objects. If deformed it will after a short time regenerate to its original shape. The cocooning should although not be set under continuous pressure from any objects. To cover the ceiling power outlet we have included a simple to install white metal cover which makes it easy to install the trumpet Lamp.